Is there anything more perfect than cream cheese stuffed inside of a buttery crescent roll? We think not and everyone who sampled this recipe agree. As these babies bake up, the cream cheese slowly melts to create the perfect out of this world roll. I’ve had to make a second batch of these delights because they were gone before dinner was even on the table. Preheat oven to 400. Combine cream cheese and cheddar cheese, season with salt and pepper. Bring a small pot of water to a boil and season with salt. Blanch asparagus until crisp tender. Remove and stock with cold water to stop the cooking process. Dry thoroughly on paper towels. Roll out crescent rolls and separate at the seams. Spoon 1 teaspoon of the cream cheese filling across the wide end of each triangle. Add 3 spears of asparagus and roll up in the classic “crescent” shape. Place each roll on a cookie sheet and brush top of each roll with some of the egg wash. Bake for 10 minutes, until golden brown. 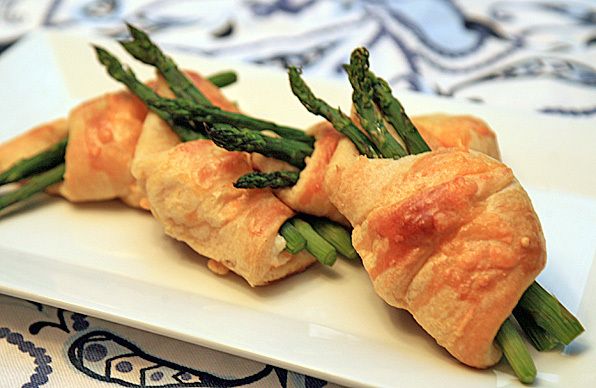 I made these a few nights ago to have with dinner…they were absolutely AMAZING!I chopped the asparagus and put it inside the crescent rolls, but loved it just the same! will DEFINITELY make them again! If you haven’t tried them, DO IT NOW! You’ll LOVE THEM!! DELICIOUS!! !